The Black Cultural Centre is please to be able to offer summer employment positions this year. The application deadline is May 27, 2016 at 4pm. 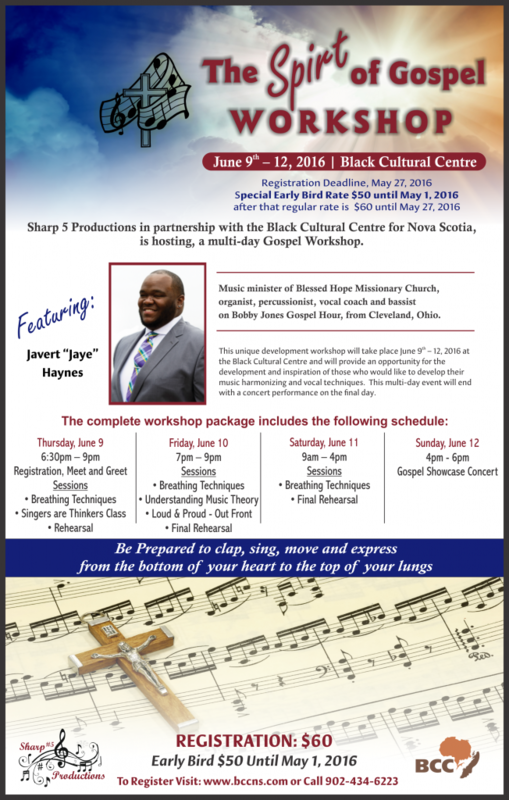 Sharp 5 Productions in partnership with the Black Cultural Centre for Nova Scotia, is hosting, a multi-day Gospel Workshop featuring Javert “Jaye” Haynes, music minister of Blessed Hope Missionary Church, Cleveland Ohio. Haynes is an organist, percussionist, vocal coach and bassist on Bobby Jones Gospel Hour. This unique development workshop will take place June 9th – 12, 2016 at the Black Cultural Centre and will provide an opportunity for the development and inspiration of those who would like to develop their music harmonizing and vocal techniques. This multi-day event will end with a concert performance on the final day. Registration is $ 50 per person with limited spaces available. Register Now! Early Bird Registration Fee of $ 50 until May 1, 2016. After that period registration fee will be $ 60. 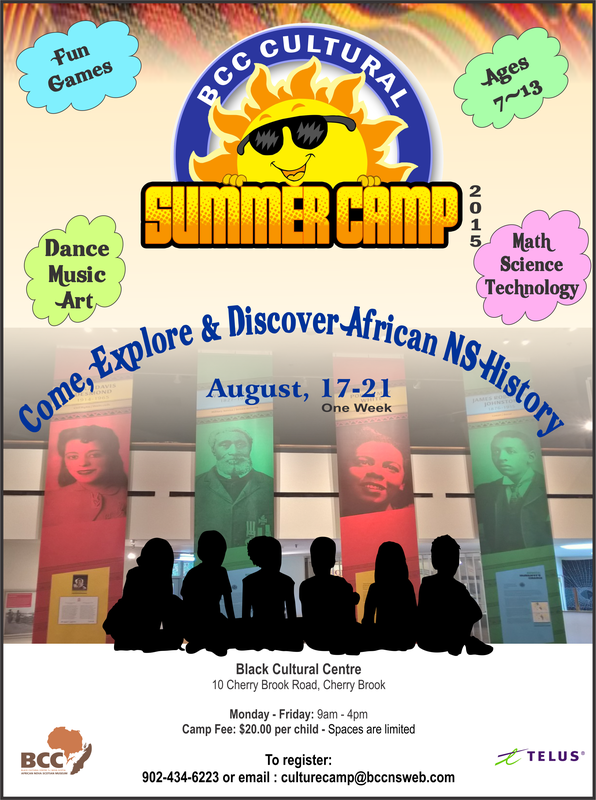 Register at the Black Cultural Centre or online by clicking the “register” button below. 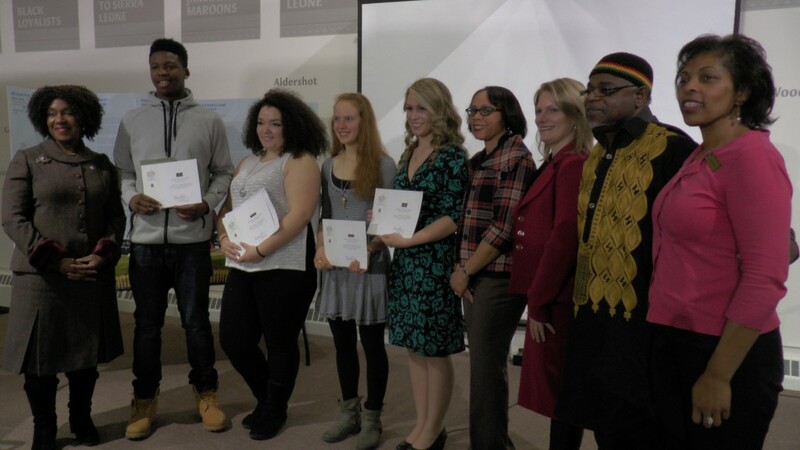 The Black Cultural Centre in partnership with RBC hosted the second annual Atlantic region Black History Month Essay competition. This competition is part of a larger national competition that RBC has been offering since 2012. An audience of over 200 high school students from across the province took part in the event, which featured guest speakers and essay presentations from the local finalists. RBC (Royal Bank of Canada) asked high school students applying to Canadian colleges or universities to tell us their stories of how black Canadians have helped define Canada’s heritage. Students from across the country sent in their essays. Throughout February, we’re celebrating Canada’s history and its future by publishing the 25 scholarship winners. Congratulations to all the winners! In addition to the Essay Completion the event also included the launch of a new book titled “Viola Desmond’s Canada” written by Dr. Graham Reynolds and Wanda Robson. Both were on hand at the Centre to mark this special celebration. The Black Cultural Society / Centre of Nova Scotia, the 100th Anniversary Planning Committee, in partnership with Canada Post, will be unveiling a limited edition stamp featuring the No. 2 Construction Battalion. Along with the unveiling, the committee will be sharing details on the many events taking place over the next few months to commemorate and remember the No. 2 Construction Battalion. 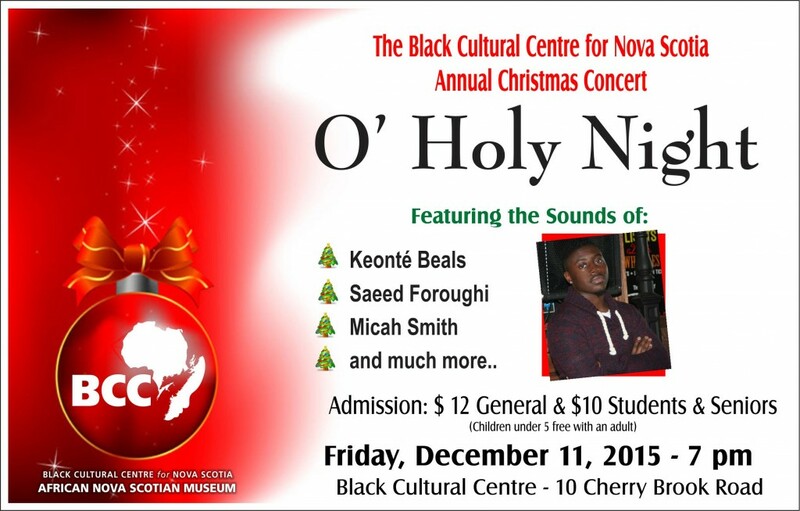 Where: Black Cultural Centre for Nova Scotia, 10 Cherry Brook Road, Cherry Brook N.S. When the First World War broke out in 1914, Black Nova Scotians responded patriotically to the call to arms. Despite being ready and willing to serve overseas, and contrary to official government policy, they were told by most unit commanding officers “this is a white man’s war.” As a result, the vast majority of Black men were turned away to avoid an integrated army. Determined to serve, Black Canadians rallied for equality. The solution was a segregated battalion. On July 5, 1916, over 600 Black men – about 300 from Nova Scotia and another 300 or so from the rest of Canada, the United States and the British West Indies – formed No. 2 Construction Battalion, C.E.F. The all-Black construction unit, commanded by white officers, was designated to support the front lines on the Western Front in Europe. They assisted four forestry companies in logging, milling and shipping lumber ‒ an essential commodity during the war ‒ dug trenches, built railroads, repaired roads and laid barbed wire to contribute to the combat troops in the achievement of their mission. Their sweat and tears peppered the fields of France and the unit returned to Canada in January 1919. In September 1920, the Battalion was disbanded, only to fall back into the shadows. Their legacy was not brought to light until decades later by the late Senator Calvin W. Ruck and the Black Cultural Society / Centre. 2016 marks the 100th anniversary of the formation of No. 2 Construction Battalion (aka the “Black Battalion”). Canada’s first and only segregated all-Black unit paved the way to a future of diversity, as demonstrated in today’s armed forces. With the simple desire to serve their country, these men forged a remarkable legacy and are an important part of this country’s history. The purpose of this program is to increase awareness of the history of No. 2 Construction Battalion and provide a greater understanding of the sacrifice and efforts made by these Black Canadian soldiers. The Black Cultural Society / Centre of Nova Scotia and the Centennial Planning Committee will be hosting and taking part in several months of events and activities commemorating No. 2 Construction Battalion. The program will culminate in a large-scale event to be held July 9, 2016 in Pictou, Nova Scotia – the site of the battalion’s official monument. 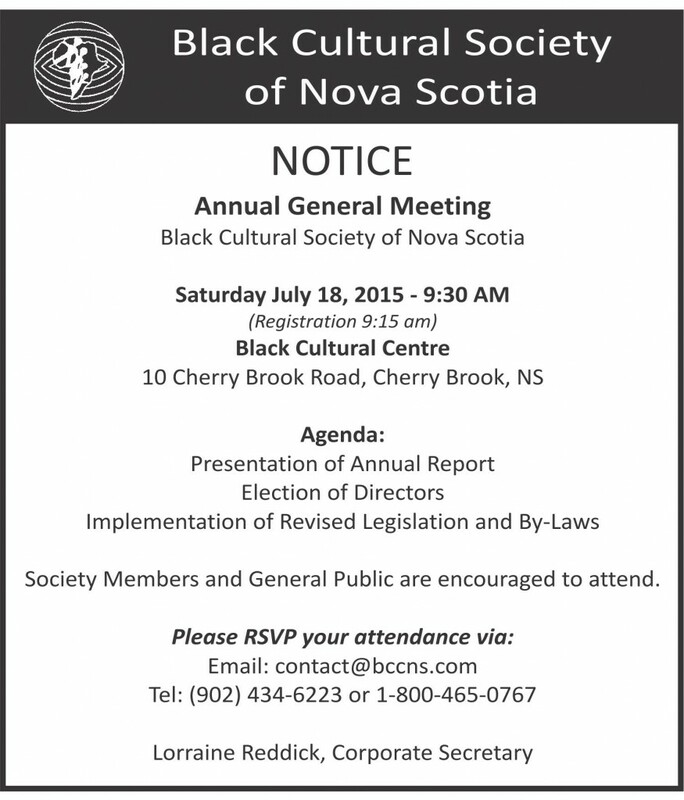 The Society for the Protection and Preservation of Black Culture in Nova Scotia (better known as the Black Cultural Society) was incorporated as a charitable organization in 1977. The Society’s Board of Directors is made up of representatives from various Black communities throughout Nova Scotia and one representative of the African United Baptist Association. The genesis of the Black Cultural Centre lay in a proposal put forward in 1972 by Reverend Dr. William Pearly Oliver for the creation of a Cultural Educational Centre to meet the needs and aspirations of the Black Communities of Nova Scotia. The sod-turning ceremony took place April 24, 1982. Seventeen months later, on September 17, 1983, the Centre officially opened. Many events have taken place at the Centre, such as cultural portrayals in the form of music, plays, concerts, as well as educational activities in the form of workshops, lectures and guided tours. Programs of the Black Cultural Centre extend beyond its doors to the broader community of Nova Scotia. This outreach is achieved through cultural events across Nova Scotia. Follow us on Twitter @RememberNo2 and Like us on facebook.com/theblackbattalion. Don’t miss a thing! To stay up-to-date on all happenings related to the 100th anniversary of the Black Battalion, sign up for our monthly newsletter, which will feature the Black Battalion in the news, a monthly calendar of events and much more! Simply opt-in by e-mailing theblackbattalion100@gmail.com.